If you are looking for a disposal, you should be aware that name alone isn’t everything. In fact, I would say that most people are hard-pressed to name three manufacturers of garbage disposals. While the big names have great reputations for a reason, they are not the only ones with a great product. 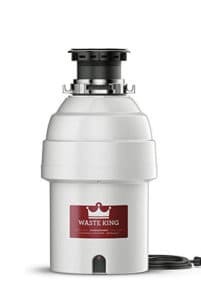 Waste King offers both commercial and residential garbage disposals, and they have a well-established reputation on Amazon and among other major retailers. With that in mind, I know that I would sacrifice a few of the advanced features of more advanced disposal systems for a quality standard disposal. It is interesting to note that, if you widen your search for a disposal, you can save hundreds of dollars and still get a disposal that fits your needs. 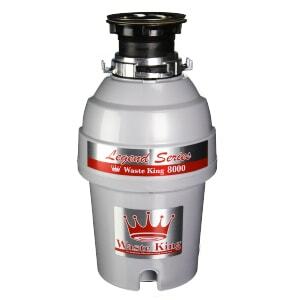 If you are trying to save a few dollars by comparison shopping, I would have to give the Waste King L-8000 the Best Value Garbage Disposal title. The Waste King L-8000 doesn’t skimp on performance or noise reduction. It is the most powerful disposal available from Waste King with a high-performance one horsepower motor. The motor operates at high range of rpms and is a continuous feed disposal. Reviews have indicated that the Waste King L-8000 is considerably quieter than older, less reliable disposals. If you don’t want to listen to all the grinding and noise associated with it, Waste King has you covered. The motor can grind almost anything you throw in its stainless steel chamber. It is a continuous feed disposal so you don’t have to wait to continue grinding. One horsepower and 2800 rpms show real performance for a relatively cheap disposal. It also features stainless steel impellers that reduce jamming. You should be able to grind some serious kitchen scraps with that much power. It is about as powerful as residential garbage disposals get. The Waste King L-8000 features stainless steel grinding components, including the stainless steel grinding impellers that reduce jamming. The grinding chamber features stainless steel construction as well. The use of superior materials prevents corrosion for the life of the disposal. The best part of the quality construction efforts is that Waste King is confident enough in their disposals to guarantee the parts for life. This is a limited warranty that only protects the original owner, but it definitely ensures a smart investment for your home. The Waste King L-8000 is relatively easy to install and comes complete with select drain fittings. You should only need to use basic hand tools and maybe some plumber’s putty for a basic install. If you have a dishwasher, and want the benefits of running the waste from it to the disposal, a dishwasher hook-up kit is also required. The L-8000 comes in a three-screw flange installation design for standard installation and some special sink considerations. Most customers will opt for the easy to install quick installation option. This option allows you to simply align, spin and click the disposal into the flange you install on the sink drain. The Waste King L-8000 comes at a very low price, and Amazon customers are very happy with the product. You can check out the reviews yourself on the Amazon site. It doesn’t have the polished and expensive looking feel to it, but it is in the cupboard after all. The impressive part of this disposal is the power and the price. A one horsepower garbage disposal at this price is definitely worth the look. There is a lot to like about the L-8000. I am happy to give it the title of Best Value Garbage Disposal. It has plenty of power for a disposal today and also gets good marks on the warranty.